Join 75+ employers for the Spring 2019 Career Expo! Professional attire is required for entry. 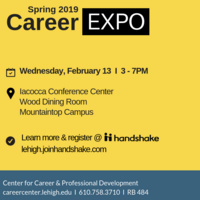 The Career Expo is an excellent event for Lehigh students to discover job and internship opportunities, explore careers and industries, and grow your professional network.